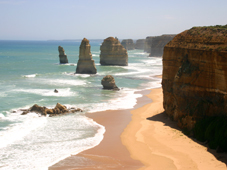 A trip to the 12 Apostles and a Great Ocean Road tour is a must from Melbourne. The Great Ocean Road is one of Australia's most spectacular scenic routes. The twelve apostles, huge limestone stacks along the cliff-lined Southern Ocean, are a world renowned natural wonder. They were formed by the rough ocean relentlessly pounding against the limestone cliffs. Firstly, this formed caves, which then became arches, which over time collapsed, forming rock stacks of up to 50m high until even these erode and collapse into the ocean. These formations used to be called 'Sow and Piglets' before being renamed the 12 Apostles in 1922. However, there were never twelve, but nine! After the collapse of a 50m stack in 2005, only eight 'Apostles' remain today. 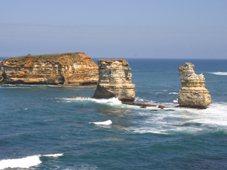 The Twelve Apostles are, however, only some of the many limestone formations along the Great Ocean Road. Until recently, there used to be the London Bridge, over which you could walk out onto the limestone outcrop. This collapsed in 1990, leaving two tourists stranded. There is also the Grotto, a limestone cave right on the beach, as well as other arches and outcrops. Another important site is the Loch Ard Gorge. This was named after an English clipper ship that tragically ran aground there. You can take the steps down to the beach, to which the only two Loch Ard survivors managed to swim. The whole 130 km stretch of cliff lined coast between Warrnambool and Cape Otway is known as the Shipwreck Coast. Due to the rough seas and the inhospitable cliffs, there were over 50 shipwrecks during the 1800s. 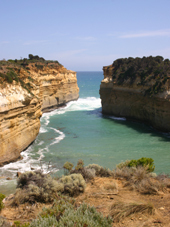 There is a large choice of Great Ocean Road Tours from Melbourne, or you can easily drive along the Great Ocean Road yourself. The 243 km long road is divided into two distinct parts: the Surf Coast with its mellow rolling hills and forests from Torquay to the Otways, and the rough cliff lined Shipwreck coast with the 12 Apostles and other limestone formations. The drive to Torquay, the start of the Great Ocean Road, takes just under 1.5 hours from Melbourne. At Torquay is the famous Bells Beach, where the surf world championships are held each January. 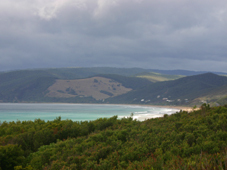 This is the start of the popular Surf Coast that, with great surf and swimming beaches, stretches from Torquay to Lorne. The drive to Lorne takes about 45 minutes. As you wind around the Great Ocean Road curves, it is a surprise and pleasure seeing the landscape with its green hills, blue water and white sands unfolding around you. There are breathtaking panoramas, lookouts, beaches and cliffs, and a lighthouse at Aireys Inlet. After Lorne, the rich rainforest of the Otways begins. Its valleys are lined with tree ferns, rivers, creeks and 8 stunning waterfalls. To see these waterfalls, follow the rivers on a detour, taking the road inland from Lorne. From there you will find signposted walking tracks to the various falls. The 45 minute drive between Lorne and Apollo Bay takes you along a high and narrow stretch of the Great Ocean Road. Its ruggedness, beauty and wildness have given it the reputation as the most spectacular part of this great drive. Apollo Bay is a picturesque small town with beautiful sheltered beaches at the foothills of rainforests, creeks and waterfalls. From there you could walk the Great Ocean Walk, 104 km along deserted beaches and through the National Parks, to right within sight of the 12 Apostles. After Apollo Bay, the Great Ocean Road itself heads inland through the Otway National Park. After 15 km there is Maits Rest, a boardwalk through a beautiful garden of giant ferns and huge around 300 year old trees. Inland there is a skywalk the Otway Fly that takes you through the treetops of the cool rainforests. 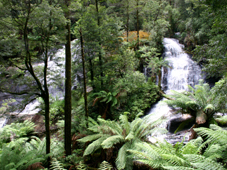 Within the Otway hinterland are six waterfalls, with signposted walking tracks to each. On the coast you can visit the Cape Otway Lightstation, set up to make the journey along the shipwreck coast a bit safer. The Otways are the place to see an abundance of real Australian wildlife swamp wallabies, koalas, ringtail possums and grey kangaroos. 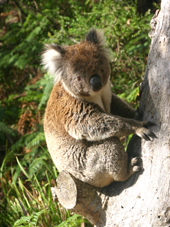 We have never seen as many Koalas out in the wild suspended and climbing through the eucalyptus trees as on the drive to the Otway lighthouse. Just past Cape Otway, on the Great Ocean Road, is the picturesque Melba Gully rainforest walking trail that takes you past the 'Big Tree', a reminder of the giant trees that used to be in that area. The Great Ocean Road stays, for a large part, inland in this area, but touches the coast at Glenaire, which has stairs down to the beach. However, the ocean is wild there and not recommended for swimming. Further along, you can take a detour to Johanna, which has excellent surfing, towering cliffs and pristine beaches also not for the fainthearted. The next stage of the Great Ocean Road takes you through the Port Campbell National Park, along the top of the limestone cliffs. This part of the drive is not as scenic as the Otways, and much more rugged. However, this is where you find the must-see 12 Apostles, the massive eroding limestone monuments of the sea. You need to park your car and walk across to the cliffs and be awestruck by their size and beauty, which is especially impressive at sunset. They are a bit of a tourist pilgrimage with a lot of people walking along the fenced of paths you can even fly over them by helicopter. However, just of few kilometres down the road are other, almost equally impressive limestone formations, such as the Loch Ard Gorge and nearby Muttonbird Island, the Island Arch, the London Arch no longer London Bridge, and the Grotto. Each of them is signposted along the Great Ocean Road and easily accessible by short walks from the car parking areas. Port Campbell is a beautiful small fishing village along the inlet of Port Campbell Bay, which after the rugged Southern Ocean offers a pleasant calm and great lunch stop. It has quaint shops and cafes, and we managed to catch one of its interesting craft markets, held some Sundays during spring, summer and autumn. After a while, the Great Ocean Road turns inland again, and you will come to the Bay of Islands dont miss the turn off to this! There are a number of limestone towers, pounded by the rough winds of the Southern Ocean. We found the Bay of Islands one of the most spectacular sights along the Great Ocean Road, especially at sunset. As this area is much more secluded than the 12 Apostles. You can go for walks down to the beaches without really meeting anybody. Further along is the Childers Cove, another shipwreck site. 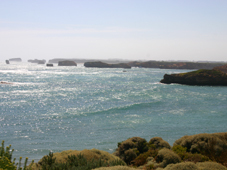 The end of the Great Ocean Road is the country town of Warrnambool. From there you can take a shortcut drive to Melbourne via the Princes Highway, or the slightly longer scenic volcanic plains route along the Hopkins-Hamilton Highways. Both will take you back to Melbourne in only around 3.5 hours. 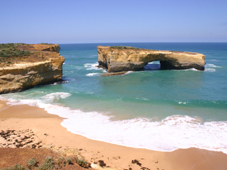 The 12 Apostles and Great Ocean Road are one of a kind and one of the must do Melbourne tours. If you have the opportunity, take a two day rather than one day tour to allow you to fully take in such variety of landscapes or you might have to come back another time.